Question: Who played the Percussion part on the “NEXUS Ragtime Concert” LP and CD? The NEXUS LP record titled, “NEXUS Ragtime Concert” was made in 1976 in Toronto. It was recorded using the best technology at the time: the direct-to-disc process, in which a performance was recorded in real time directly from the mic to a cutting stylus to create the master disc, from which all copies were made. This process eliminated the intermediate step of audio tape transfer, and produced a cleaner sound. The technology was short-lived, however, because of the emerging digital recording process used on compact discs. The direct-to-disc process required a completely UNEDITED performance in real time for each of the two sides. 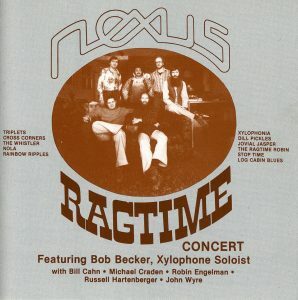 In 1979 a second edition of the “NEXUS Ragtime Concert” LP was released on the UltraFi label, and it used takes that were different from the original 1976 LP. In 1991 the original direct-to-disc master was used to make the compact disc version (“NEXUS Ragtime Concert” NEXUS CD #10284) which is still available from NEXUS Records. The percussionist on this LP record/CD was Michael Craden (1941-1982). He played on a unique variety of small percussion instruments that were placed on a table and struck with various sticks and mallets. Because his amazingly creative playing was entirely improvised, the recording engineers who were ‘riding’ the volume controls for the cutting stylus, were severely challenged in trying to avoid volume overload. In fact, one or two of the ‘takes’ had to be discarded due to overload peaks in the percussion. The possibility of overload distortion was simply something that had to be accepted as a part of the direct-to-disc process in order to capture the excitement of a live performance. Ultimately, several overload-free takes were recorded for each of the two LP sides. More about Michael Craden can be found elsewhere on the NEXUS website.